St. John’s wort is widely known as an herbal cure for depression. In some countries, such as Germany, it is commonly prescribed for mild depression, especially in adolescents and children. The available evidence suggests that the St. John’s wort extracts tested in the included trials are similarly effective as standard antidepressants and have fewer side-effects than standard antidepressants. The rate of side-effects was half that of newer SSRI antidepressants and one-fifth that of older tricyclic antidepressants. St. John’s wort can cause many serious interactions with prescription drugs, herbs, or supplements. Therefore, people using any medications should consult their doctor. 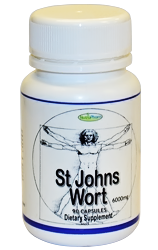 Each capsule contains St. John’s wort 20:1 extract standardized 0.3% (equivalent to 6000 mg dried herb). Each bottle contains 90 capsules. Dosage: Take 1-2 capsules per day or as recommended by a health care practitioner.